Android users have been looking forward to the launch of Sky Go on their smart-phones since quite a while now (it was already available on the iOS since a long time), and now they are going to get exactly what they were waiting for. UK broadcasting giants Sky have confirmed its Sky Go app for Android which will be made available at the end of February. The app will allow owners of Google Android smart-phones to access live broadcasts from all five Sky Sports channels, ESPN, Sky News, Sky 1, Sky Living, Sky Atlantic, Sky Arts and 11 Sky Movie channels, providing they subscribe to the relevant package, from their device. Sky have also promised to bring more home entertainment in the palm of our hands with new programmes like Luck, Blue Bloods Season 2 and The Love Machine all scheduled to air live on the go. 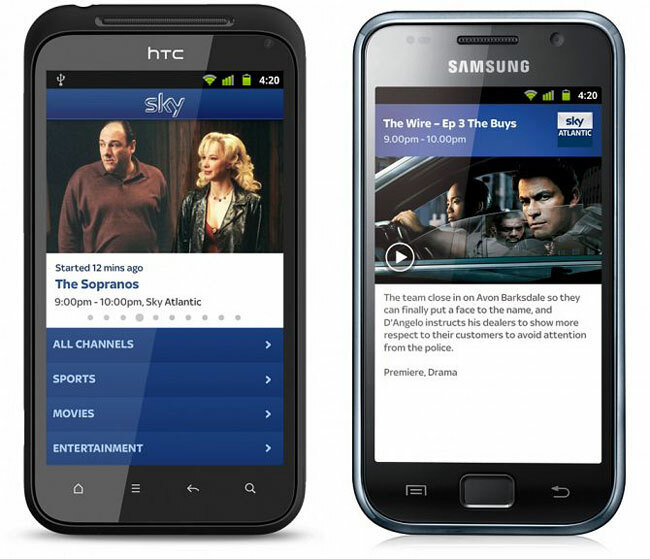 Initially, the app will only be compatible with the HTC Desire and Samsung Galaxy S range of smartphones , as well as the HTC Sensation and the HTC Incredible S.
Furthermore, on demand access for Sky Movies from the Sky Go Android app will be made available later this year and the Sky Sports F1 channel will also be introduced across all Sky Go platforms in March. Sky Go is the online TV service from the broadcaster that was formally known as Sky Player. It allows subscribers to the satellite TV service to watch live broadcasts from over 30 channels on their PC or Apple iOS device, along with thousands of hours of on-demand TV shows and movies from channels including Sky 1, Sky Atlantic, Sky Living and Nickelodeon. Unfortunately Sky Go is going to be available to customers in UK and Ireland only and there might be a possibility of a global coverage of the app some time later; though no official word has come out as yet. Simply wish to say your article is as astounding. The clearness for your submit is just cool and i could suppose you are a professional in this subject. Fine with your permission let me to grasp your feed to stay up to date with approaching post. Thank you one million and please continue the enjoyable work.